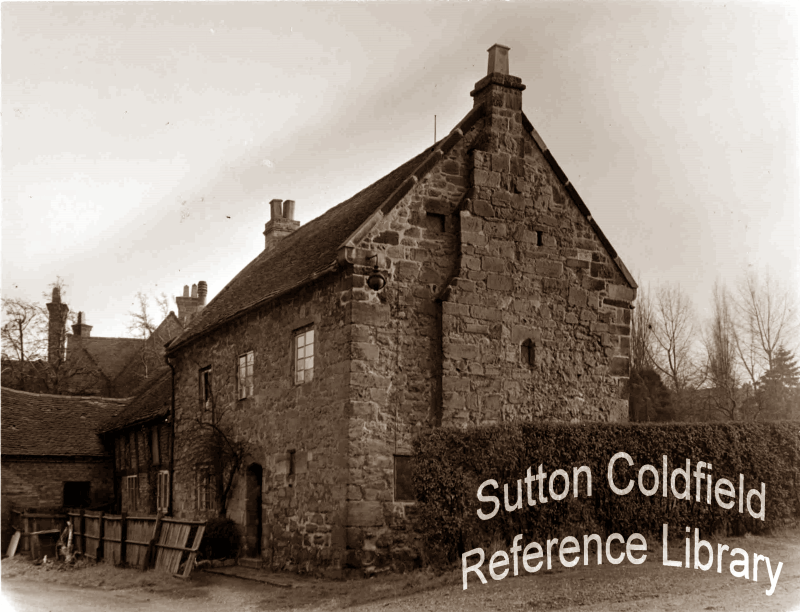 Dugdale’s Antiquities of Warwickshire, 1656, records that Bishop Vesey built fifty-one stone houses in Sutton, and John Leland in his Itinerary , c.1540, says that Vesey settled his poor kinsmen in them. One house still standing, the Stone House at Maney in Maney Hill Road, dating from about 1530, was occupied by one such “poor relation”, Christopher Vesye. Christopher Vesye may have been poor in comparison with the Bishop, who was very wealthy indeed, but in fact he was a prosperous yeoman, a member of the Corporation, and Warden in 1537 and 1555 - he paid a chief rent of eighteen shillings. Christopher Vesye died in 1559, (five years after his wealthy relative the Bishop), and he was succeeded by his grandson, also called Christopher, a minor. This Christopher, variously spelt Vesey and Veisey in the Court Rolls where his name appears as one of the jurymen in 1582 and 1602, was succeeded by his son, another Christopher, and the Stone House at Maney continued in the family for another hundred years. In 1674 Thomas Veasey is listed in the Hearth Tax records, living at Maney in a house with four hearths. The Vesey stone houses are very plain in design, but they were meant for people who previously lived in what we should call hovels, the bishop being an early pioneer in dealing with the housing problem. The Maney stone house is the largest of the surviving ones, measuring 33ft 6 ins by 20ft (10.2 metres x 6.1 m.); a stone spiral staircase gives access to the first floor and the attics and there is a hearth at each end of the house on each floor. There used to be an extension to the house, a timber-framed building with brick nogging, added early in the seventeenth century. In 1674 the Stone House was the farmhouse of Thomas Veasey (or Vesey), and was surrounded by farm buildings. It passed to his son John, and on John’s death in 1703 to Mary Snell, John Vesey’s daughter. The Maney section of the Rental for 1742 shows Mr. Snell’s heir paying eighteen shillings for the stone house. The Vesey connection finishes in 1761 with the sale of the property to Thomas Wheeler by John Orton whose wife, Rebecca Snell, was John Vesey’s granddaughter. The Parochial Valuation of 1857 gives the dimensions of the house as 20' 6" x 35' 9", with an extension 18' 3" x 22' 9"; there were two barns, a cow-house, stables, a pigsty, a wagon house, a chaff house and a coach house. St. Peter’s Church was built nearby in 1905, and in 1918 the parish purchased the stone house, which became home to successive vergers - the 1940 photograph shows the extension still standing. The last verger retired in 2003, and the parish decided to sell the stone house; today the grade 2 listed house stands alone, having been meticulously restored by the present owners, Mr. and Mrs. Barr.